Welp, I did it. I finally ordered my camera. The camera I've been drooling over for a while now. This little gem. I had waited a bit because I wanted to see if I could get lucky on eBay (no such luck) or if any local stores were going to have any freakishly good sales or something like that (again, not happening). As it turns out, Amazon was the best price. Crazy, right? I think I'm now a believer in that website, for realsies. Anyway, after much thought, I decided to go with the kit lens (18-55mm - and I'm not even going to pretend to know what those numbers mean at this point in the game). If the company I work for is feeling as generous as they were last year, I'm hoping for a gloriously refreshing bonus within the next month, so with a bit of that money I will be able to rationalize getting this lens. Because we all know I'm slightly portrait-obsessed, and word on the street is that that is the lens to go with. I was pleased that Jay didn't make me feel guilty about this purchase at all. That's not to say that he's a mean old husband who never wants me to follow my dreams; it's just that under normal circumstances we are savers as opposed to spenders. (It's for that same reason we are still sleeping on the mattress from hell, why I have serious issues spending more than $25 on any item of clothing, why I will probably never, ever upgrade my iPod mini to something a wee bit more sleek, and how Jay and I prefer a good happy hour to a fancy dinner.) But I'm thinking that Jay doesn't really have room to complain, as we're going to be spending both of our entire stimulus checks (and then some) on his graduation gift. I don't think he's decided yet if he's going to get the new video camera, or go with a new/used Macbook with Final Cut Pro. Either way, the man is getting something super exciting, and I'm glad that I was at least able to spoil myself just a tiny bit, as well. Did I mention my husband is graduating within the next two weeks? Heck, yes! He's worked so incredibly hard for this. And now? He just needs to rub elbows with anyone in the film industry, so he can work his camera skills. Anyone good friends with Spielberg? Anyone? No? In other news, the husband was straight up talking in his sleep again last night. I used to freak out, because I watched this show where this guy tried to kill his wife in his sleep by choking her, and for some reason I thought that Jay's sleep-talking may somehow escalate to that point. But it hasn't as of yet, so now it's just entertaining. I get to hear nubbins of a one-sided conversation. me: (thinking) Okay, just had a stroke. What the hell. Jay: "I ALREADY ASKED HER." me: (thinking) Asked what? Asked who? Tell me he's not dreaming about Jennifer Love Hewitt. Tell me. Jay: "NO, I DID. I ASKED HER." me: (thinking) Okay, I'm over it. me: wide awake for the next fifteen minutes. Congrats on your new camera!!! That's so exciting!! Yay! Ooh-- just looked at your currently list-- first of all, i'm really sorry if you have to get surgery but I hope those kidney stones start behaving themselves. Secondly-- you're listening to Ben Kweller?! Do you know how freakin awesome you are?! Ack! I love that guy. I don't know anyone else who listens to him. YAY! oh congrats on the new camera, that's so exciting! and i love the random sleep talking stories, so funny. Congrats! Can't wait to see all of the amazing photos you will take with it! 2. Whenever you say 'nubbins,' I think of Chandler Bing. 3. Our matress is SUPER crappy, too. And I have an Ipod mini. And I hate spending more than $25 on a piece of clothing (including pants.) Which is why I'm totally giddy about finding $5 Ann Taylor Loft petites. Every time someone tells me they like my outfit, I'm all, "TEN DOLLARS!!" Loooove your new camera. Though I am with Ashley on the jealous factor. And my girlfriend and I have 'sleeptalking' episodes weekly. I used to work at a gym at 6am every morning, and when I'd be all ready to leave, I'd go say goodbye to her, and she'd start mumbling in her sleep back to me. "No, not the purple elephant.. You can't take that one - It's my favorite!" and others of the sort. Now she gets up before me and I'm the one with the crazy ramble. Eeeee!!! Congrats on the new camera! That's awesome. Your going to have soo much fun with it. Hehe sleep talking. As if you would make that up lol. I'm sure it's all so harmless. Yay for your new camera! I am obsessed with photography as well so I know how exciting that is. I haven't ventured into the more more advanced cameras yet, I still do basic digital work, but I love it. I literally LOL'd when i read the bit about your husband talking in his sleep. I love when stuff like that happens. Except sleep walking. That kind of creeps me out. Oh man a new camera! I'm kinda jealous. I will be purchasing a new camera soon. I'm so excited about it. I punched Andrew just below his face while I was sleeping and the next night he told me I called him an F*** face. Apparently I'm violent in my sleep. I don't ever remember doing these things before. Weird. I'm drooling right now over that camera. And apparently TB has full-on conversations with me in my sleep. Like he can ask me questions and I'll answer. I hope I'm never trying to keep a secret from him! 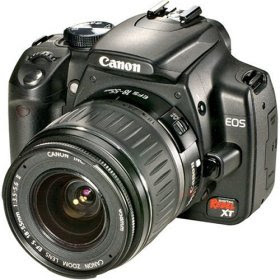 Ok, I know this is like the most delayed comment ever but....my first fancy camera was the rebel xti I LOVED it. Seriously, I cried after I sold it earlier this year. And the kit lens is a great little mulit-purpose lens. And I"m not sure if you've gotten it yet but you MUST get the 50 1.8. In the industry it's nicknamed the Nifty Fifty because it's so cheap and such a good little lens. I had mine for about a year and used it ALL THE TIME.